Apart from various Government websites falling victim to Hacking attacks, the latest to be targeted by hackers belongs to the world's richest cricket Board, the Board of Control for Cricket in India (BCCI). 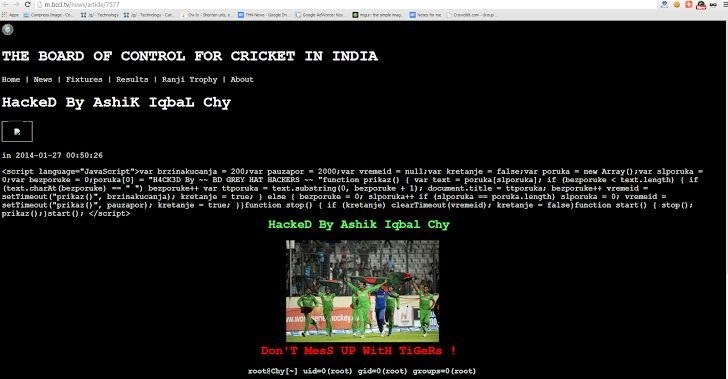 Late night on 26th January (65th Republic Day of India), the official website of Indian cricket’s Governing body, BCCI.TV has been defaced by Bangladeshi hacker who goes by the name Ashik Iqbal Chy. The ‘About Us’ page on the website has the message “Don’T MesS UP WitH TiGeRs!” along with the image of the Bangladesh national cricket team running with the Bangladeshi Flag. The ‘Attack’ on BCCI’s website is most likely in response to the latest draft proposal, which aims to shift the control of global cricket from the hands of International Cricket Council (ICC) into the hands of top three cricket boards BCCI, Cricket Australia (CA), England and Wales Cricket Board (ECB); therefore the fate of cricket in smaller countries like Bangladesh, New Zealand and others is set to be left in the hands of these three cricket boards, which seems not to be digested by them. Recently, there also have been protests in Bangladesh against this proposal and the Bangladesh Cricket Board (BCB) has itself took a stand on the issue and is strictly against this new proposal. The proposal will be placed in front of the ICC executive board on January 28th and 29th, and will need approval of seven out of 10 full members to become a reality. The BCCI website has been shut down completely with no active links on their homepage. At the time of publishing this article, the homepage of the Indian cricket Board website was 'under maintenance'. Well, this will be seen later that the draft proposal will become a reality or not, but for now BCCI may have to face more cyber attacks from other small countries.